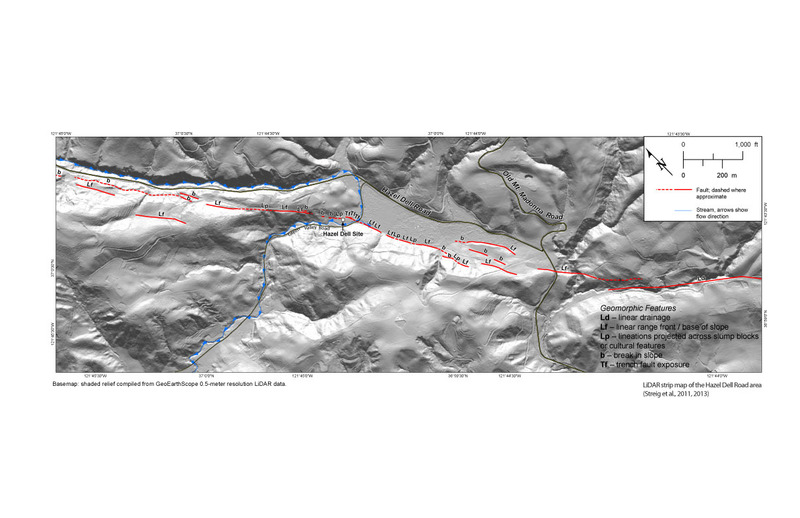 High-resolution LIDAR imaging pinpointed good locations for paleoseismic studies at Hazel Dell across a section of the San Andreas Fault in the Santa Cruz Mountains. Offset and disturbed sediments combined with carbon dating of detrital charcoal and buried axe cut wood chips provide conclusive evidence of larger magnitudes and amounts of displacement for the historical 1838 and 1890 earthquakes. Taken together, three large magnitude (i.e., greater than M6) earthquakes along the Santa Cruz section of the San Andreas Fault System occurred over about a 70 year timeframe before the 1906 event, illuminating the manner in which the fault system transitions from a creeping section to a locked section. Historic accounts highlight three significant earthquakes in 1838, 1865 and 1890 in the San Francisco and Monterey Bay regions. Previous paleoseismic studies on the Santa Cruz section of the San Andreas Fault could not distinguish all of these events in the Earth’s surficial layers. Small-scale fault features at Hazel Dell noted in high resolution LIDAR data, downloaded from Open Topography, projected toward the investigation site and helped researchers precisely locate trenches. Sixteen trenches were dug revealing mudflow, alluvium, colluvium, fissure and scarp deposits. The Hazel Dell trenches show offsets and disturbances from four earthquakes. Carbon dating of organic materials help to connect the offsets to the 1838, 1890 and 1906 earthquakes along the San Andreas Fault. The trench data suggest that the 1838 earthquake was a larger magnitude event than previously estimated, at least a moment magnitude 7 with slip at Hazel Dell of at least 1.5 meters. The 1890 earthquake was also a larger event with a moment magnitude greater than 6.2 and displacement at Hazel Dell of 0.5 to 1.7 meters. Together the results indicate three large earthquakes (i.e., 1838, 1890 and 1906; all greater than magnitude 6) over 68 years along the San Andreas Fault. The new results suggest that the San Andreas Fault System shifted character from a sequence of several large earthquakes in the 1800s to one very large, multi-segment earthquake in the 1900s. Recognizing this change in character may help to better understand earthquake mechanics on the San Andreas Fault System.